The human immune system is a complex network of millions of immune cells, which act together to protect the body from constant exposure to threats from our environment. In most cases, the immune system does a great job of keeping people healthy, but during certain times of the year or times of stress, the immune system may require additional support. Abundant studies have shown the active ingredients in Imu-Max to be especially supportive to the immune system. Active polysaccharides and polyphenols provide immediate support for immune challenges, promote healthy inflammatory balance and provide extra antioxidant protection. 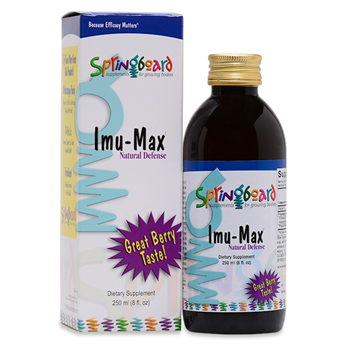 Imu-Max is a children’s formula including two key botanicals that strengthen antioxidant reserves and support the immune system in fending off challenges. Used in Israel as an over-the-counter medicine, Imu-Max includes echinacea, one of the best-known botanical supplements used to boost the immune system, and propolis, a product of bee resin, which helps balance microbial activity and supports healthy inflammatory balance . This convenient liquid supplement includes a 300 mg standardized Echinacea angustifolia and purpurea blend plus 150 mg propolis and vitamin C in a delicious berry flavor. Take with water, milk or the beverage of your choice.